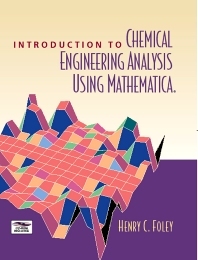 This book provides an introduction to chemical engineering analysis- which reviews the processes and designs used to manufacture, use, and dispose of chemical products-and to Mathematica, one of the most powerful mathematical software tools available for symbolic, numerical, and graphical computing. Analysis and computation are explained simultaneously. The book covers the core concepts of chemical engineering, ranging from the conservation of mass to chemical kinetics. At the same time the text shows how to use the latest version of Mathematica, from the basics of writing a few lines of code through developing entire analysis programs. Undergraduates taking first courses in chemical engineering and senior undergraduates taking courses in analysis and computing. Also practicing chemical engineers, professional chemists, materials scientists, and applied physicists.